One Baby Sarong/One Mommy/One Daddy Sarong. Wailea Massage is currently located a few minutes away by car from all the big hotels in Wailea. We are also no more than 10 minutes away from all Kihei locations. Formerly located for 20 years in the Renaissance Wailea Beach Resort (now Andaz) until its closure in 2007 and for 10 years in what is now the Wailea Marriott; we offer Luxurious Treatments at more affordable prices. Please come join us for a treat!! 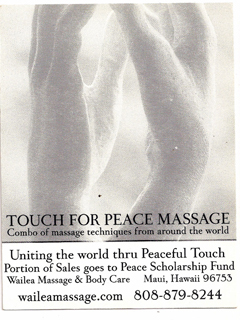 Portion of sales of Touch for Peace treatment funds high school scholarship-how higher education will promote peace. To attain universal peace each of us plays a part. Massage is a first step in self transformation. One becomes more familiar with their body, more at ease and peaceful and in so doing parents propagate Peace, starting with self, to their family, community, statewide, nationwide, global.